There is something about late meetings that make you hungry. Or maybe it was that we missed dinner? Either way, my family ended up with a late night dinner at the Steak 'n Shake in Cleveland, TN. Even at 10:00 p.m. The place was bustling with activity. Teens, couples and families nearly filled the restaurant. 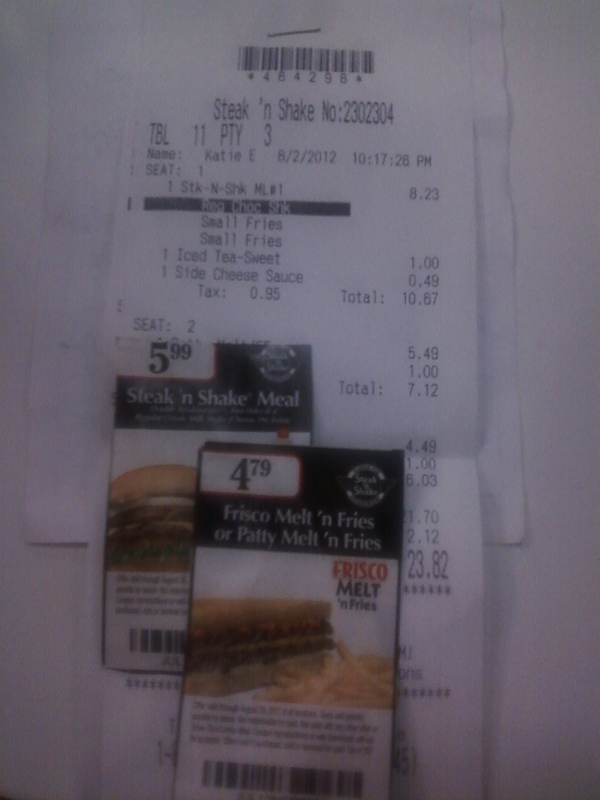 Despite the crowd (or maybe because of it) the servers at Steak 'n Shake were perky and friendly. They were out of sweet tea (a sacrilege in the South) but willingly offered to brew up some more while Hubby willingly waited. Steak 'n Shake restaurants take their inspiration from the 50's diner concept. There is a counter near the front door. Booths and tables are off to the side. Decor is mostly white and red with black accents. Chrome touches also feature prominently. The music that plays in the background is largely from the 50's,60's and 70's. Dinner here was like walking into a time machine. The only thing missing were the poodle skirts. The Steak 'n Shake in Cleveland, TN is a fun peppy place to be. We ordered basic menu items. I chose the patty melt with fries. 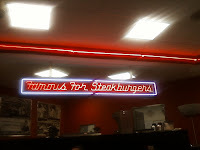 Hubby got the Wisconsin Buttery Steakburger with fries and our daughter selected the Double Steakburger Meal. With a coupon, her meal came with one of the tallest fountain milkshakes that I've just about ever laid eyes on. My patty melt was well done but not burned. The rye bread is cooked on a flat grill so it was greasy, limp and fit the stereotypical patty melt perfectly. Fries at the Steak 'n Shake are the thin shoestring variety. Another minute in the fryer might have made them crispier. They were served hot and tasted good. I opted not to send them back because the place was hopping. Hubby enjoyed his Wisconsin Buttery Burger. Order something else if you're watching your cholesterol or waistline. It's two large hamburger patties with cheese, sauteed onions and butter. He loved it. I'll take his word for it. Our daughter said that she enjoyed her Double Steakburger at Steak 'n Shake. She asked for cheese but the server forgot to add it and had to go back. It turned out to be a soft nacho-styled cheddar cheese instead of traditional slice of American. Our daughter ended up putting some on her sandwich and using the rest on her fries. The server checked back a few times but refills were a little slow in coming. The restaurant was pretty busy for the entire time that we were there. Peak periods often yield slower service in any eatery. Our server was consistently personable and friendly. She even set us up with full take out cups before we left. As you see in the photo, it's the milkshakes that set Steak 'n Shake apart from other eateries. 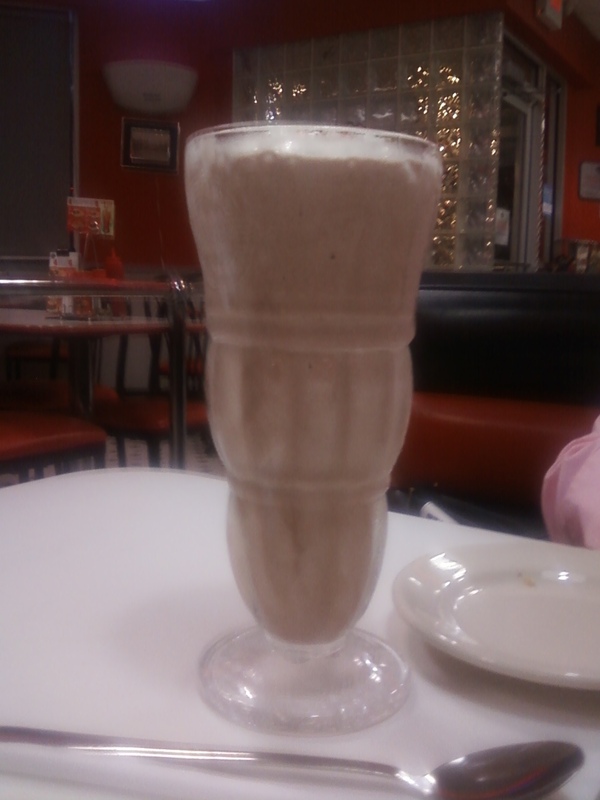 They serve the traditional, hand dipped milkshakes in the tall soda fountain glasses. Then, they added whipped topping and cap it off with a cherry. It's perfect for sharing with a friend or two. 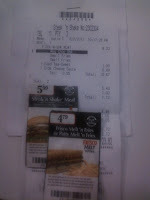 Dinner for the four of us started out a just over $23 with tax. Coupons from the Sunday newspaper dropped the price to $20 and a change. In all we ordered three entrees, three drinks and a milkshake. I feel like the price is a bargain for a sit-down meal. The Steak 'n Shake also has healthier fare. Next time, I'll probably order a salad or something lighter than a patty melt. For the occasional treat, it was a pretty darned good meal. Click below for a review on a 50's style lunch counter in Knoxville.